Blog Quick Quotes: Crazy Boy Fun with Neva! 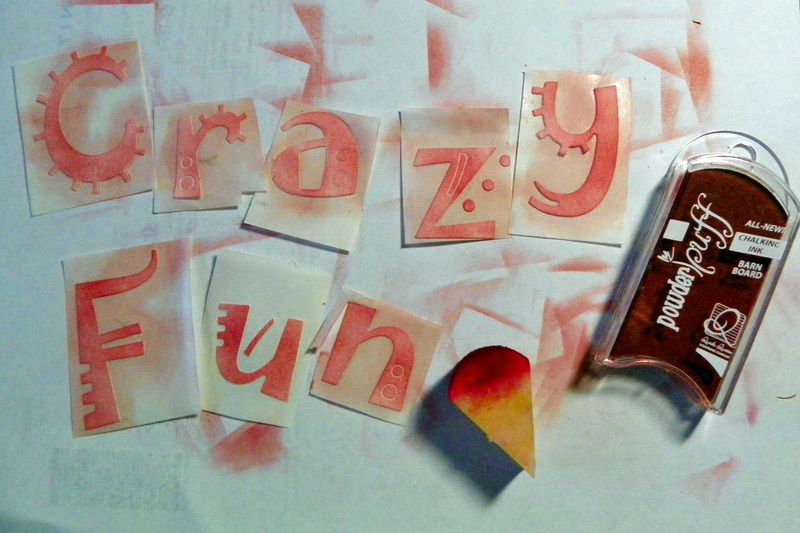 Crazy Boy Fun with Neva! Hello Quick Quotes fans, Neva here to share a layout of recent events from our part of the world. A few sheets of the Far and Away collection was a great background for this fun two-page spread. 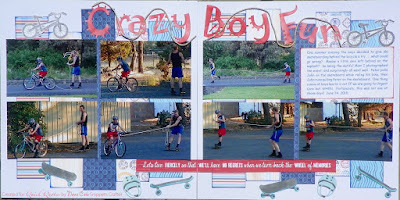 I had partials of a several patterns, and was able to create two copies, one for each of the Crazy Boys' albums. Each sheet is trimmed to 2" x 12" to start. The patterned strips are laid on the white cardstock background and the photos are placed over the top to determine the length of each strip. The strips are trimmed to between 9 3/4" and 11". Each strip is inked with Powder Puff Chalking Ink in Deep Sea. The strips and photos are adhered to the layout. One of the sayings from Far and Away 500 Quotes and Phrases was absolutely spot-on for this layout and is trimmed to span the two pages before adhering below the photos. I have this great die cut set that allows you to create skateboards and helmets among other things. 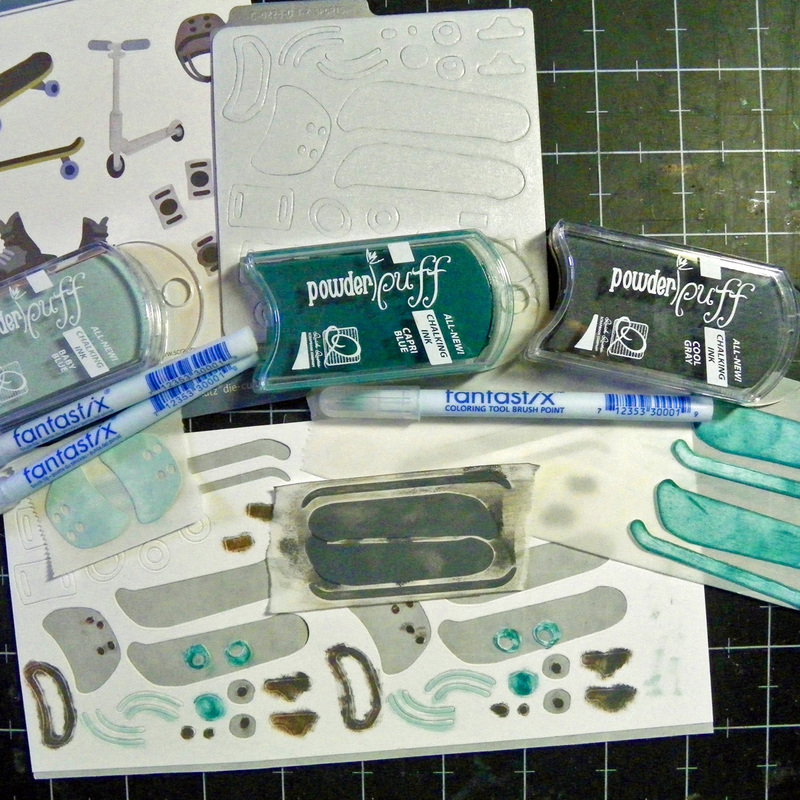 First I ran the white cardstock through a Xyron to make it easier to make stickers from the tiny pieces. A few of the pieces are removed and placed on different recycled backing sheet to ink with PowderPuff Chalking Ink in Baby Blue, Capri Blue, or Cool Gray. Other pieces are left on the original sheet and are colored with a Fantastix and the PowderPuff Chalking Ink. 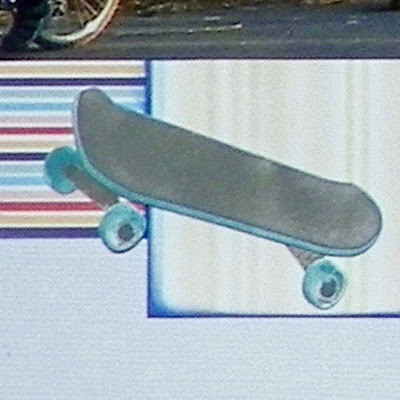 The helmet has 12 individual pieces, and the skate boards have 8 and 9 pieces! Time consuming, but pretty cute when they are done! 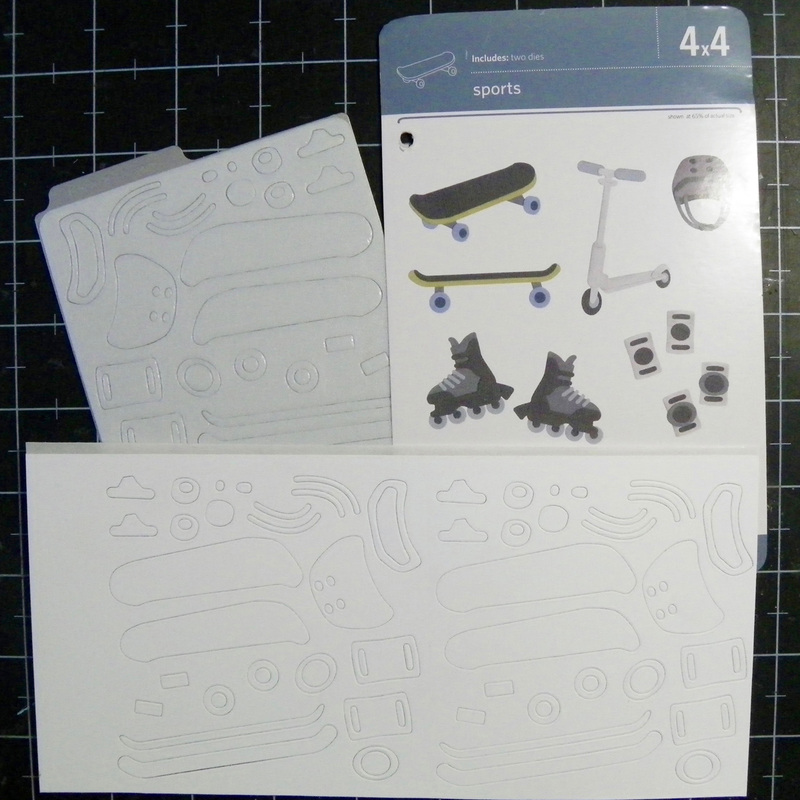 White cardstock with Xyron adhesive backing is die cut. When the surrounding paper is removed the ink will also cover the edges of the letters. The letters are inked using an Ink Blusher with Powder Puff Chalking Ink in Barn Board. The color nicely balanced the sentiment across the bottom of the layout. Close ups of the title. 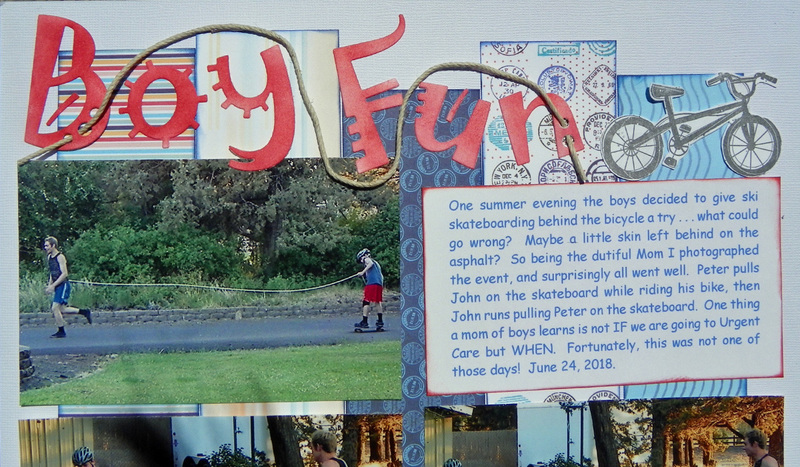 I am a mother of boys, and those of you who also have sons will appreciate the journaling! A length of hemp cord is threaded through the holes in the title letters and wound around the rest of the letters, then adhered with rolled glue dots at strategic points. 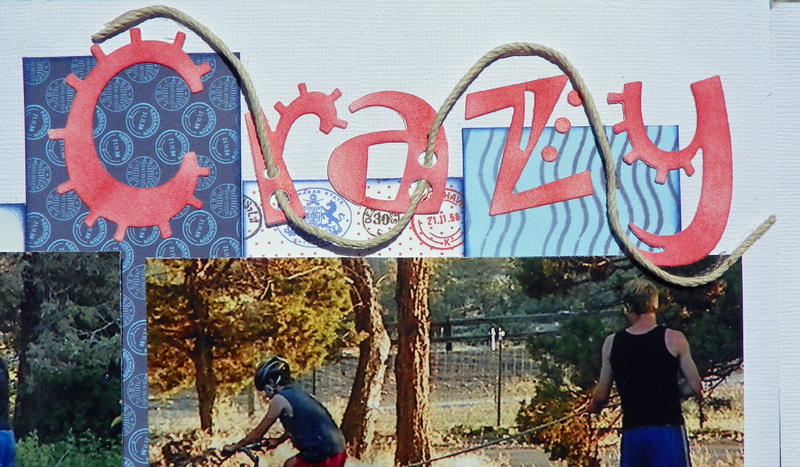 A perfect representation of the rope in the photos! 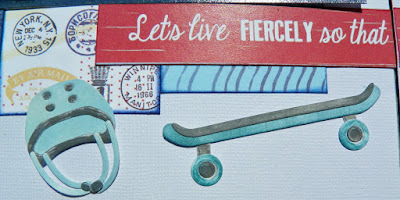 The bicycle is stamped in Cool Gray and is fussy cut. When adhered the bicycles are grounded on the photo and journal block. The journaling is printed on white cardstock and then edged with Barn Board before adhering to the layout. 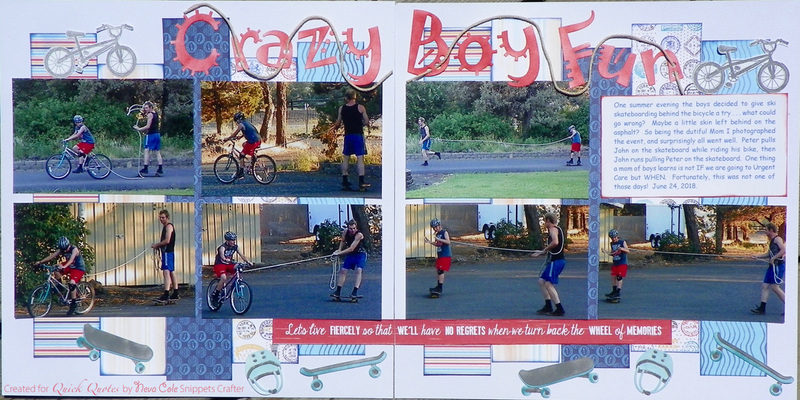 My boys really enjoyed seeing this layout of their recent fun together. I hope you enjoy creating your own layouts with bits and pieces of collections you have on hand! Thanks so much for stopping by and enjoy your summer activities!